Carlo Campanini, the famous comedian and actor, met Padre Pio for the first time in 1939. Carlo had learned a little about Padre Pio from his friend, Mario. They were both working for a theater company at the time. When Carlo and Mario knocked on the monastery door at Our Lady of Grace, they were greeted by Brother Gerardo. When they told the Brother that they were interested in speaking to Padre Pio, he told them that since it was Holy Week, it would be impossible. He explained that Padre Pio always suffered from the wounds of the stigmata, but his sufferings intensified during Holy Week. No one was allowed to visit him at that time. Carlo tried to convince Brother Gerardo to make an exception to the rule. He said that he and Mario had been looking forward to meeting Padre Pio with great anticipation. They had used their time off from work to make the trip from Bari. However, Brother Gerardo would not change his mind. Instead of leaving, Carlo and Mario decided to stay at the monastery for a while.They walked around the grounds and made a visit to the little church that was connected to the monastery. They hoped that if they waited long enough, they might run into Padre Pio. In order to pass the time, Carlo and Mario were cracking jokes and laughing as was their habit. It did not occur to them that it was disrespectful for them to be talking so loudly in a sacred place. Suddenly, one of the Capuchins came out of the church and complained about the noise they were making. The Capuchin happened to be Padre Pio. At once, Carlo noticed the strong odor of carbolic acid in the air. It was so strong that it caused his throat to constrict. Many people noticed the fragrance of flowers or perfume around Padre Pio but when a strong odor of carbolic acid or sulfur or disinfectant was present when Padre Pio greeted someone, it usually indicated that the person in question needed to change his life. That happened to be true in Carlo’s case. At the time of his first visit to San Giovanni Rotondo, he was living a life that was very far from God. Padre Pio asked Carlo and his companion to state their business. “We are two poor stage actors,” Carlo said. “We are all poor,” Padre Pio replied. “But why have you come to the monastery?” “We have come here to make our confession,” Carlo answered. Padre Pio told them both to prepare themselves and he would hear their confession after Mass the following day. As Carlo looked at Padre Pio, a certain fear gripped his heart and he began to tremble. He felt that his whole life was laid bare to Padre Pio. The next morning, Carlo and Mario were present at Padre Pio’s Mass. It was the longest Mass that Carlo had ever attended in his life. He was out of practice, for one thing. Kneeling on the hard stone floor of the church caused him to feel severe pain in his knees. It was almost more than he could bear. Carlo felt a great sense of relief when the Mass was finally over. At the time of his visit to Padre Pio, his greatest anxiety was that his work caused him to be separated from his children. He and his wife were always on the road, traveling from one city to another. Their children were living with one of their relatives. Carlo wanted to ask Padre Pio to pray that he could find work that would enable his family to be reunited. If it meant that he had to leave his acting career, he was prepared to do so. However, when he made his confession to Padre Pio, he could not bring himself to ask Padre Pio for anything. At the end of the confession, Padre Pio gave Carlo absolution, but before he did so, he made him promise to change his life. Carlo gave his word that he would make the necessary changes After visiting Padre Pio, Carlo returned to Bari and then moved to Rome. He found steady work in Rome that made it possible for his family to be reunited. It was a dream come true. He knew that Padre Pio had answered the secret prayer of his heart, the prayer that he had not been able to verbalize. Working as an actor exposed Carlo to innumerable temptations, temptations that he could not always resist. He felt guilty about his immoral lifestyle but did not have the will to make the necessary changes. Padre Pio had asked Carlo to amend his life, but he had not done so. For that reason, he did not want to return to San Giovanni Rotondo to see Padre Pio. When Carlo won a leading role in a very successful film, his acting careerbegan to soar. His photograph could be seen on the cover of numerous magazines and his name frequently appeared in the newspapers. People recognized him when he went out in public. He was offered starring roles in one movie after another and was making more money than he had ever dreamed of. But fame and fortune did not bring him the happiness he longed for. Spiritually, Carlo was in a dark place. He was depressed most of the time and was haunted by a feeling of emptiness. His life had lost its meaning and its joy. He longed for peace of mind and peace of soul and prayed to God for assistance. One day, Carlo’s wife told him that the parish priest had spoken to her and suggested that their home be consecrated to the Sacred Heart of Jesus. They had even set the date. The priest wanted them all to receive Holy Communion on the day that their home was consecrated. That posed a big problem for Carlo. He would have to go to confession before he could receive Holy Communion. He dreaded the thought of it because he had many serious sins on his conscience. The embarrassment regarding what he would have to reveal in the confessional was very hard to think about. He did not know if he had the courage to go through with it. Carlo had not been to Mass or confession in a long time. Carlo knew that it was important to his wife to have their home consecrated. He also knew that if he made a sincere confession, he would be obliged to change his life. He did not feel that he was ready to do that. He kept postponing the confession. Several times he went to church and stood in the confessional line but then lost his courage and left just before his turn came. Carlo began to make one excuse after another to his wife. He finally told her that he was sorry but he would not be able to be there on the day the priest was coming to consecrate their home. One day, Carlo made a visit to the parish of St. Anthony. He looked at the confessional line and knew that he would never have the time to wait in such a long line. “Please come to the front and take my place in line,” a stranger said to him. Carlo was surprised but he took the man’s place in line. Finally, he made a sincere and heartfelt confession and felt blessed to receive the grace of absolution. Carlo and his family were all together when their home was consecrated to the Sacred Heart of Jesus on January 8, 1950. With great joy in his heart, Carlo was able to receive Holy Communion on that day with all the members of his family. He wanted to tell Padre Pio about the wonderful changes in his life and decided to make a trip to San Giovanni Rotondo to see him. He had nothing to fear now. He had already confessed the sins of his past and he would never have to do so again. Carlo began his confession as instructed, but he kept his head lowered. Padre Pio called him a coward and said, “I want you to look at me as you confess your sins.” Carlo did so. After Carlo finished his confession, Padre Pio told him that he wanted him to once again make a promise to change his life. Carlo gave him his word that he would do so. This time he truly meant it. Finally, Padre Pio pronounced the words of absolution. He gave Carlo a Rosary and told him to pray it as often as he could. He promised Carlo that he would always be near to assist him in any difficulty. 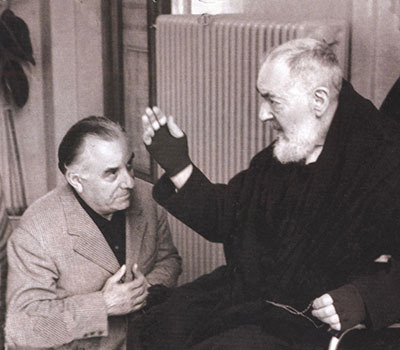 Before Carlo left the confessional, Padre Pio embraced him. From that moment forward, Carlo’s life underwent a complete transformation. There was a great peace in Carlo’s heart as well as a desire to lead a good Christian life. The next morning, he was able to attend Padre Pio’s Mass. When he received Holy Communion from Padre Pio, it felt like a hot ember had been placed on his tongue. He felt the burning sensation in his mouth for several hours. Before Carlo left San Giovanni Rotondo, he asked Padre Pio for his continued prayers. Carlo was aware that in some sense, his spiritual life would always be an uphill climb. He told Padre Pio that he was afraid of the temptations that he knew he would encounter once he returned home. Padre Pio said that it was good to be afraid of temptations, and that one should always have a certain fear of them. He advised Carlo to stay away from all the dark forces and satanic influences of the world. Padre Pio assured him of his spiritual support. It was very evident that Padre Pio’s spiritual support was with Carlo through the ensuing years. Carlo attended Mass and received Holy Communion every day upon Padre Pio’s recommendation. With his work schedule, it was very difficult to do, but he always found a way to do it. He also turned down many starring roles in films. He was acting upon Padre Pio’s advice to never take a part in a movie that had immoral content. Padre Pio had explained to Carlo that the people who made such movies would have to answer to God for their actions. That included everyone from the producers to the actors to the carpenters who built the sets to the people who sold the tickets. Padre Pio also warned Carlo never to tell off-color jokes or use bad language. If a movie script had even one vulgar word in it, Carlo would not consider being a part of the project. Movie directors and producers could not understand why Carlo was passing up such lucrative job opportunities. When they asked him for an explanation, he simply told them that he was a spiritual son of Padre Pio and that Padre Pio set a very high standard. In the summer of 1963, Antonio Ardillo became incapacitated by a stroke which paralyzed the right side of his body. When Antonio’s good friend Anna Rossi heard the news, she rushed to the hospital to visit him. Antonio showed her his arm and his leg, paralyzed and motionless. Anna felt very sorry for Antonio. She wondered what the future would hold since he supported his wife and children by working as a hairdresser and the family depended on him. Anna told Antonio that as soon as he regained his strength, she and her husband would take him to the monastery church of Our Lady of Grace to seek Padre Pio’s intercession for his complete healing. Antonio was very happy to agree to the plan. Somewhere along the way his faith had grown cold and he had stopped attending Mass. He had not been inside the doors of a church for a long, long time. Nevertheless, he looked forward to the day when he could make the trip to see Padre Pio. After two weeks in the hospital, Antonio’s condition improved so much that he was released. The only sign left of his illness was a slight limp when he walked. Anna and her husband along with Antonio and his son were soon able to make the trip to San Giovanni Rotondo. They attended Padre Pio’s Mass and were fortunate to be able to find seats in the front row. From time to time during the Mass, they became aware of a beautiful perfume, like a gentle breeze, that seemed to fill every corner of the church. Several times during the Mass, Padre Pio stared at Anna and Antonio. Anna had been praying, not only for a physical healing for Antonio, but also for a spiritual healing, so that his faith would be restored. After the Mass, Antonio went to the booking office and signed up for confession. He had time to examine his conscience and to prepare himself for the encounter with Padre Pio. Finally, his turn came. He had only been able to say a few words in the confessional before Padre Pio stopped him. “You do not go to church on Sunday,” Padre Pio said. “But my profession obliges me to work on Sundays,” Antonio replied. “I also have to work on the Holy Days and Solemn Feast Days of the Church.” “But that is not acceptable,” Padre Pio replied. “Sunday is the Lord’s day and it must be kept holy. I will not be able to absolve you.” Antonio’s confession was over before it had hardly begun. Antonio returned to his home full of sadness and disappointment. He had wanted Padre Pio’s absolution but had not received it. He decided to follow the advice of the holy priest. When he stopped working on Sundays, he felt the financial loss. Nevertheless, he was still able to provide for all of his family’s needs. He returned to the practice of his faith and felt a great peace in his heart. He never again missed Sunday Mass. 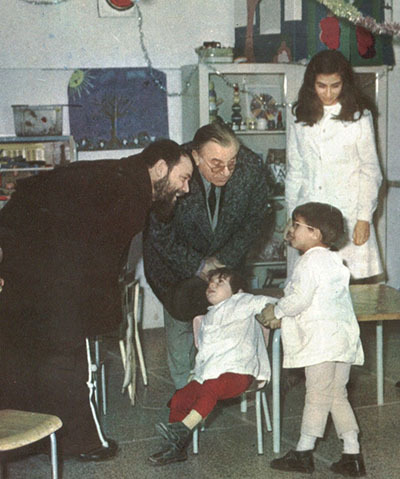 The next time Antonio visited San Giovanni Rotondo, Padre Pio greeted him affectionately and appeared to be genuinely happy to see him. He comforted Antonio and spoke to him lovingly and at the end of the confession, gave him the absolution he had longed for. Antonio’s heart was filled with great and indescribable joy. Antonio was a changed man. His wife, his children, and all who knew him could see the difference. 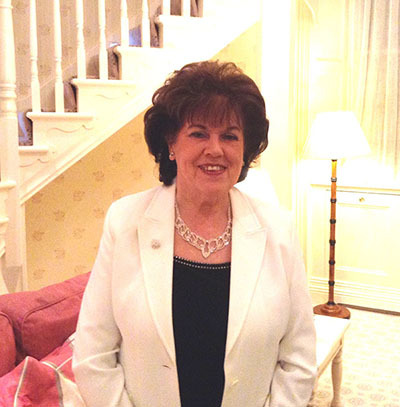 He told Anna that he was happy that he still had the slight limp when he walked, the only sign of the stroke. It was a reminder to him of how Padre Pio had come into his life when he needed him the most, and set him on the right path. In the beginning of the year 2000, I had a very strong desire to travel to Padre Pio’s shrine in San Giovanni Rotondo. The desire to make the trip was in my thoughts constantly so I finally made plans to go at the end of October of that year. I still did not understand why I was feeling such a strong pull to go there. In early September of the same year, my grandson was diagnosed with Neuroblastoma stage four cancer. It was a very aggressive form of cancer with no known cure. He was three and a half years old at the time. We were totally devastated with this news. My grandson was living in England. I live in Dublin, Ireland. I flew to England to help look after his older sister and to be with the family. I contacted Cathy Kelly, who runs the Padre Pio Information Centre, in Victoria, London, and she very kindly allowed me to take the mitten of Padre Pio to my grandson in the hospital. I gave Cathy my passport as good faith with the understanding that she would return it to me when I returned the mitten. We had the mitten resting on my grandson’s head all night, and I was begging Padre Pio to save this child. My grandson had surgery at the Royal Marsden Cancer Hospital in London. A cancerous tumor which was the size of a golf ball was removed from his brain and he was given only four months to live. He was also given chemotherapy and radiation to his brain and spine. The doctor said that if he was to survive, he would have stunted growth as a side effect of this therapy. But the doctor did not believe that he could survive. The following day, when I returned the mitten to Cathy Kelly’s office, I was totally overcome with a very strong fragrance of beautiful roses, which seemed to last for ages. I was emotional and crying and wondering what was it was all about. Cathy said that it was a sign that Padre Pio had heard my prayer. I understood then that Padre Pio would look after this child. Now I had a reason to get to San Giovanni Rotondo, and while there I was up at the chapel door at 5 am when it opened and stayed at the tomb of Padre Pio until 8 am, talking to him and praying and begging him to heal our grandchild. I told Padre Pio that if our grandson recovered, I would do something for him. I really did not know at that time how I would help Pade Pio but I would find a way. When I returned from San Giovanni Rotondo, I started the Padre Pio Devotions in Malahide, Dublin, as I had promised Padre Pio that I would do something for him. At first we held the devotions in the Carmelite Monastery in Seapark, Malahide but after six years we had to move to a bigger church because of the large crowds who attended. We are now at the Sacred Heart Church, Seabury, Malahide, Dublin. We meet on the first Friday of every month. We have an organist and choir, and we start with Eucharistic Adoration, followed by Mass celebrated by Fr. Angelus, a Capuchian Priest, who blesses the people after Mass with a mitten of Padre Pio. We always have a packed Church, with 300 to 400 people in attendance, and Fr. Angelus tells us lovely stories of Padre Pio during his homily. Last September, the members of our Prayer Group bought a beautiful statue of Padre Pio in San Giovanni Rotondo. It was shipped to Dublin for our Padre Pio Devotions which have been going now for fourteen years. Every year in September, I organize a pilgrimage to Italy. I have been doing this yearly for the past fourteen years. During our trips, we have visited Rome, Assisi, Cascia, the Holy House of Loreto, Lanciano, to see the first Eucharistic Miracle, Mount St. Angelo, where St. Michael the Archangel appeared, San Giovanni Rotondo, and more. We usually have a group of around 50 people each year. In San Giovanni Rotondo, we visit all places associated with Padre Pio, his cell, his old tomb, the beautiful new tomb where his body can be seen, the friary, the hospital, and the English office, where we see a video of Padre Pio and get a blessing with some of his relics. We also visit Manopello, the shrine of the Holy Face. Our grandson is nineteen years old now and is 5ft. 11 inches tall and is in very good health. We are forever grateful to Padre Pio for this favor and for so many other favors given to our Prayer Group members over the years. It is amazing how Padre Pio gets hold of you in so many ways and gets you working for him. He got hold of me at first when I had the strong desire to visit San Giovanni Rotondo, even before I knew that my grandson was ill. I never dreamed I would organize the Padre Pio Devotions in Dublin or the pilgrimages to Italy but I really love to do this. Padre Pio makes you work hard for him. He is our great friend! We must relearn our devotion to the Cross. It seems too passive to us, too pessimistic, too sentimental – but if we have not been devoted to the Cross of Jesus in our lifetime, how will we endure our own Cross when the time comes for it to be laid upon us? A friend of mine, who depended for years on kidney dialysis and who realized that his life was slipping away from him moment by moment, once told me that as a child, and later as an adult, he had a special devotion to the Way of the Cross and had often prayed it. When he heard the frightening diagnosis of his illness, he was at first stunned; then suddenly the thought came to him: What you have prayed so often has now become a reality in your life; now you can really accompany Jesus; you have been joined to him by his Way of the Cross. In this way, my friend recovered his serenity, which thereafter illuminated his countenance to the end of his days.